Regulators are loosening their leash on the financial industry for the first time in years. 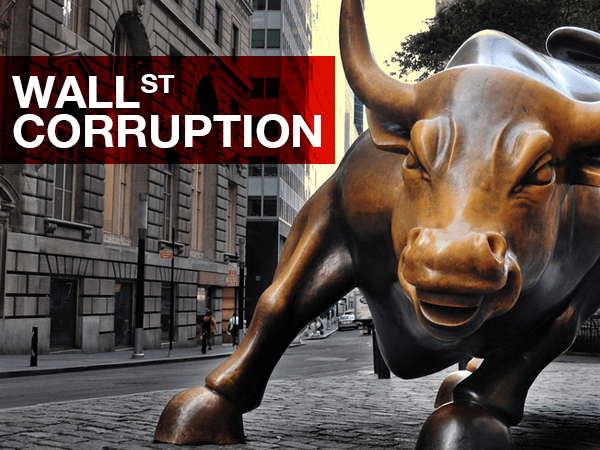 But does Wall Street really deserve our trust? When we talk about financial regulation, enforcement is the crux of the issue. The fines and penalties levied by regulatory agencies are what give laws their teeth. Lax enforcement makes regulations practically meaningless. So why are regulators dropping the ball? And how does it increase our risk of another major crisis? 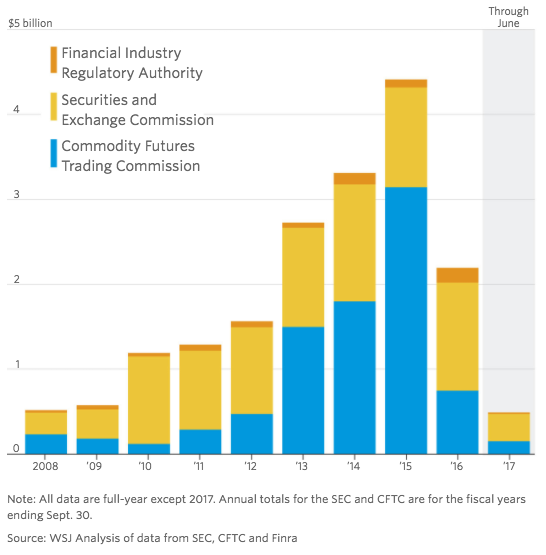 The rate of penalties levied by U.S. financial regulatory agencies is falling sharply, despite the fact that questionable dealings on Wall Street are as prevalent as ever. Compared to the first half of 2016, regulatory penalties this year are down about two-thirds. But when we look at the total amount of penalties issued by the country’s three largest regulatory agencies over the past nine years, we find something even more troubling. Between the SEC, CFTC, and Finra, penalties in 2017 are on track to be at their lowest annual level since our last major crisis in 2008. It’s safe to assume Wall Street isn’t suddenly turning over a new leaf. So what’s the explanation for this sudden drop in regulatory penalties? Regulators insist it’s just a temporary anomaly, and that we shouldn’t believe they’re any less committed to strong enforcement based solely on the recent drop. Kevin Callahan, the spokesman, said the SEC doesn’t consider six months to be long enough to draw any lessons about the agency’s effectiveness. The number of cases brought over the two periods was “relatively constant,” he added. Yes, we can take these comments at face value. But these are government bureaucrats who are quite possibly trying to talk themselves out of a corner. A more likely explanation is Washington’s current push for more “business-friendly” regulatory policy. Trump is already working to roll back major legislation from the Obama era, and his administration is stacked with four former Goldman Sachs executives: Steve Bannon, Gary Cohn, Steven Mnuchin, and Dina Powell. When regulators fail to enforce the law through penalties, they’re silently endorsing reckless behavior in the finance industry. And as we’ve seen in the past, if you give Wall Street an inch, it takes a mile. On top of that, it seems that Washington’s recent shifts in policy, while well intentioned, could bring us back to the same kind of regulatory environment that birthed our last devastating crisis. In the face of the carte blanche that Wall Street is practically receiving, before we’re painfully forced to repeat history, it’s critical that Americans protect themselves. If you don’t hold any physical assets, like gold and silver, we’re here to help.